Donkey Kong Tropical Freeze Switch final boss walkthrough as Funky Kong. 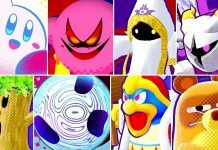 A new ending will appear after the Lord Fredrik battle in funky kong mode. This is the ultimate battle between Funky Kong and Lord Fredrik. Who will win in this 1080p battle? I know what you are thinking. King K. Rool should have been the final boss. Good game, but I miss King K Rool. I just beat this game and I can tell you something, this game is amazing when playing as funky kong. The speed is just wow. I found this boss easier on the switch than on the Wii U when playing dk in both version for some reason. Oh god, I just thought of something. Please don't tell me that Nintendo is going to put Lord Fredrik as a playable character in smash bros switch to promote this game because I rather have king k rool. Well if anyone they'd probably go for Funky Kong. Same here. Thouvgh I wouldn't complain if we got Fredrik. Why isn't he in the ending cutscene? Lord Fredrik is shaking his in Bowser's Castle! Bill Cipher!